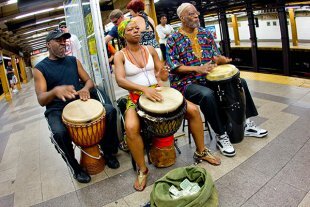 NEW YORK CITY – AUG 29: Music Under New York African hand-drummers perform in Penn Station, NYC on Aug. 29, 2012. MUNY has been presenting music to commuters of NYC public transit since 1985. The NYPD has made a big show of sanitizing the subway system so far in 2014, removing panhandlers, peddlers, the homeless and artists, writing tickets and making arrests. So far this year, panhandling arrests are up 260%, and arrests for dancing in train cars have also spiked: 240 arrests so far compared with fewer than 40 in the first half of 2013. The arrests are “classic Bratton,” according to Eugene O’Donnell of John Jay College of Criminal Justice, referring to NYPD Commissioner Bill Bratton’s fetishizing of broken windows-style policing and his unique affinity for New York’s transit system. According to Bratton, by targeting low-level crime, the NYPD is preventing more serious situations from developing. The theory is wildly held, but remains unsupported by any substantive research. Despite the arrests,Mayor Bill de Blasio says no crackdown exists, but has indicated his support for “broken windows” nonetheless. For its part, the NYPD acknowledges that dancing on the subway cars is not a major issue for New Yorkers, and that no injuries have been reported as a result of the performers. Early-on in his first turn with the NYPD, Bratton rejected notions of “community policing,” disparaged it as “social work,” leading even Ray Kelly to take umbrage at the zero-tolerance approach. “You can probably shut down just about all crime if you are willing to burn down the village to save it,” Kelly told Time Magazine in 1996. So what exactly is going on, and what are the long-term implications of spending a tremendous amount of city resources policing an issue no one but the NYPD has raised as a problem? We spoke to Heidi Kole, who has spent the last ten years performing music underground, about what she has seen in the Bratton/de Blasio era. The interview has been edited for clarity. Tell me about getting started as a busker. The first time I sang underground it was in the dead of winter. It was freezing and dark and completely frightening to be honest. I’d performed all over the globe but in those trains I felt completely naked. But once I got up the courage and began to sing that first day underground, something happened on that platform at 59th St. While I was singing, something left me and what remained was this unexpected feeling of abandonment and joy. I had no idea what’d happened that day, but in all my years of performing on stages all over the US and the world, I’d never ever felt quite like I did on that platform that first day underground. It wasn’t until I’d finished writing my book, ‘The Subway Diaries’ four years later, that I realized, what had left me was ego. And once your ego is not in the foreground, ruling your every move and thought, what you’re left with is a feeling of complete and utter bliss. That’s what got me and that’s what’s kept me coming back. Don’t get me wrong, it’s not always easy busking in the New York City Subways. Sometimes you have really bad days. But after you’ve been underground for a while you know for every bad day you have, you’ll stumble on a good one to even it all out. And busking, it’s not for everybody. It’s blistering in the summer, freezing in the winter. It smells, it’s loud. But there’s something magical about what happens down there. It’s the people, and that unspoken dialogue/exchange of energy that happens down there on a daily basis – that’s why I do it. People connect to the music, to sound. And the kindness we experiences down there as buskers is the kind that often leaves you speechless. For instance, on hot days there are people who I don’t even know who will just on their own accord bring me bottled water, placing the bottles, without a word, into my case. Total strangers will ask ‘Where have you been? You been ok? We’ve missed you!’ I’ve had girls, arms filled with shopping bags, give me things they’ve just bought, because they loved the music and wanted to show their appreciation but didn’t have any cash. From the smiles to the nods, from the donations to the dancing, the kindness flows freely under New York. Buskers are curious souls. We’re like urban anthropologists. We see everything. We feel the moods of the city, the country and often the planet very intensely. We notice it all. We have to so we know how to connect day in and day out to those around us without words. There are days down there that I feel like I’m a Red Cross worker in a vibrational disaster zone. But I still keep trying to reach out & break through that wall. Every day we want to make it work, to connect with the hundreds who pass by and hear us under New York. And we do. Just some days it takes a little longer than others. 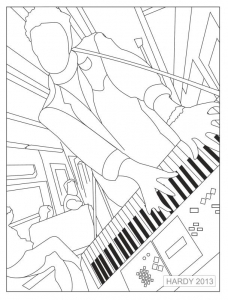 The NYPD has been making a big deal in the media about their crackdown on subway performers. What is really happening underground? Do you notice a difference? Yes. The ‘Brattonization’ of the subways has been rough on us all. They’ve made it clear that we will be arrested or ticketed for performing in the Subways. It seems clear that the musicians, artists, dancers…etc are all now lumped into the category of those ‘undesirables’ who need to be eliminated from the island of Manhattan. But for what reason? Well, I have my thoughts on that. And yes, I feel the pushback. The Subways are pretty quiet now. There are days when I don’t see any musicians, and this is the height of the tourist season when the trains are usually at their most bustling art-wise. Normally at this time of year the underground would be bursting with music from every corner. But this year, even Times Square, is virtually silent. In the ten years I’ve been performing underground, there’ve always been sweeps, but since Bratton came in, it’s been intense, very long-winded and very aggressive. I get really pained thinking about it because I feel like they are targeting my family. I don’t see anyone anymore, none of my friends when I go down there to sing. I keep thinking back to Nazi Germany where people were just ripped from their communities for having done absolutely nothing but existing. It makes me sad every time I think of my world, what has been my family of buskers all ticketed and/or arrested in such a forceful manner for simply making music, dancing and making people smile. It does not bode well for anyone in New York City when the artists, the spontaneity and creativity – the heartbeat – is ripped from this island. What are people being arrested or ticketed for? Oh wow, the list of excuses the NYPD give is lengthy and never ending. They’ll say my guitar case is a safety hazard, that I’m blocking traffic, distracting New Yorkers from being alert to dangers on the platform, or the best one is that whatever spot I’m performing in is a terrorist target – that last excuse is usually whispered by a cop leaning in really close as if he’s sharing some major trade secret. Let me say however, I’ve observed that for the most part the cops don’t want to carry out these instructions and they tell me over and over how they hate to ticket and arrest us. There is the rare bird in blue that is “out for blood” but for the most part they know the tickets and arrests are illegal and unfounded and they carry out their orders with hesitation and a whole lot of “caveats” as to why they have to do this. Basically it boils down to them keeping their jobs at our expense and I think I’ll leave it at that. Do you fight the tickets? I do. Yes. Because they are illegal. But every time I do I have to take a day or two out of my life to go to court. It’s two days for four to six hours each time. It’s a lot of time and stress and for the New York Taxpayer, a huge waste of your money and manpower in my humble opinion. It’s heartbreaking to me. This has been my world. It’s been my family for the entire time I’ve been in New York City. They are disbanding my family, my life, my community. All we do is make music and make people happy. We don’t go down there to beg for money. We go down there to exchange energy, to attempt to change how someone feels for a brief moment, maybe three minutes, maybe fifteen if they hang around for a few tunes. Anyone who is successful down there knows that. It’s a self-contained world under New York. Many of these guys I only see when I’m underground busking. They don’t have cell phones, don’t have a computer. It’s kind of like a treasure hunt if you want to find someone underground, but when you see them, it’s so magical, it’s like a homecoming and you inevitably have so much to catch up on in between tunes. Now I have no idea where anyone is. Everyone I’ve known for over a decade, everyone I wrote about in my book – they’ve been scattered by Bratton and his army. I feel passionate about doing everything I can to protect this small enclave of artists and this crazy magical world under New York. We, when left to our own devices, on a daily basis turn the grey, dark NYC subways into: a concert hall, a disco, a party, even a wonderland for so many, young and old, who did not expect to be moved while traveling from point A to point B. It’s the very best of the unexpected and what would life be if ….if everything were not…pre-determined, pre-approved. Why do you think they are targeting the artists under New York? We are a really unique community down there underneath New York City. And like many others who have chosen to move more and more of their existence “off grid,” non-participation seems to be the key trigger point in becoming a target. I’ve been down here for ten years, and have watched, during this recession and the last one, as everything above ground was falling apart, we, underground, remained un-phased. We under New York exist without any laws, no law enforcement, guns, kings, queens, no hierarchy, no one is in charge, no one is at the top or the bottom. There are no rules written down for us to learn or memorize. 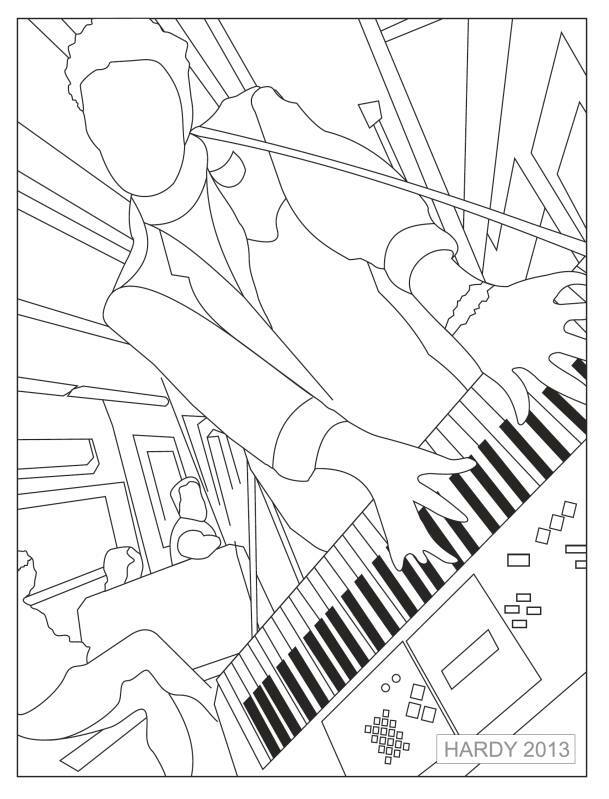 There is no “training” or “certificate” or test to pass to “be an artist” in the New York City Subways. And despite all the things we don’t do and don’t have that everyone, en masse, appears to have accepted as “givens” of living on planet earth, no one dies, no one gets maimed, no one gets attacked and no one dies. And more than that, it all miraculously just works. There is a “system,” a flow to it all under New York, don’t get me wrong. This flow takes about 1-2 years to learn. It is a pretty intense learning curve, but so is anything worth absorbing in my opinion. And there are really only a few things you learn: how you don’t set up on another performer who is already playing, how to approach a musician to inquire about a spot, where to play and good times to play… etc. And those few things you absorb as you learn the ropes under New York actually benefit the entire community, all of us. They don’t benefit a ruler, a leader, a head honcho, or a busker with the most money or power – no, anything, everything you learn under New York allows us all to keep on doing what we all do – make art. You just learn the things that are beneficially useful to all of us, to keep the community functioning. We are a fully functioning working community. We make it work without oversight or participation in “the system” and that right there….that is a huge threat to the status quo. Like home-schoolers, those who raise their own food, collect their own rain water or heal their own illnesses – we don’t contribute to the system of death, destruction and modern day financial slavery. So, yeah, that appears to be a problem and yes we’ve become a target. What about the subway acrobats? It seems like Bratton has a particular hatred for them. Bratton’s argument is that this is dangerous. But I’ll remind people here in NY that not one person has ever been maimed or killed by a street performer, at least that I know of, and how many random killings and beatings do the NYPD inflict upon innocent New Yorkers every day? In London the Police Chief has been quoted as saying that street performing is a “gateway to bigger crimes”, and I don’t know if that’s how Bratton feels, but given his reignited “Broken Windows” campaign, where he’s actively targeting smaller crimes to stop the larger ones from happening, I’d venture to say those two are on exactly the same page where buskers are concerned. They both appear to consider buskers as criminals, and they are both wrong about that. Busking is not a crime. And with these kids and their dancing, let me be really clear here; Bratton is not saving them from a life of crime – he is pushing them right into it. These kids, the dancers, are smart and bold. They are innovative, creative and well-rehearsed. They have taken initiative and through hours of practice and hard work have created a self-run business for themselves where they’re making good money and they’re their own boss. They make really good money on those trains, I see them counting it after their shifts, which, by the way, is a strong indication that there is actually a need for the entertainment they provide. If there was not, they would not make any money and their efforts would be self-limiting. But the opposite is the case – they are highly successful which can only mean people, on average, enjoy the shows. And trust me, Bratton, you take away the job these guys have created and they will not do an about face and go work at a McDonald’s. You take away their business of dancing, of making art and being their own boss and the only other option they have where they can a) work for themselves and b) make that kind of money is dealing drugs. Bratton has now basically pushed these kids straight into the drug business. They chose a good road and he’s just, in one go, punished them for it. You’ve hinted at the sort of larger implications of getting rid of street performers, of sanitizing the city. What exactly is at stake? People think of New York as a vibrant place of creativity and spontaneity and Bratton is systematically killing that. The heartbeat of this city is the color and he is now calling that color ‘criminal’. If this is allowed to continue, you are going to end up with a city that’s just a cement version of “Anywhere USA” – a whole lot of Starbucks and corporate owned chain stores. You take away the creativity and spontaneity, all these art forms popping out here, there and everywhere, and New York is just an overpriced, smelly, crowded cement island. What Bratton is terming ‘criminal’ are the same grass roots, spontaneous outpourings of art that have birthed what many consider mainstream pop culture today. From jazz to hip-hop, from rap to break-dancing and on and on, it all started in the streets and much of it in New York City. That’s what’s being killed here, ingenuity and life from the ground up. You kill the non-sanctioned art and the venues where people make it and you kill the arteries and veins of this city. There is a lot of freedom in what I do, when I’m not in court. And the longer I’m down there, under New York, the more absurd it seems what is going on up here above us on the streets. There is rarely a day here in NYC where I don’t walk past a militarized NYPD officer sporting a machine gun slung across his chest. Have you walked past Madison Square Garden recently? The contrast is stark. 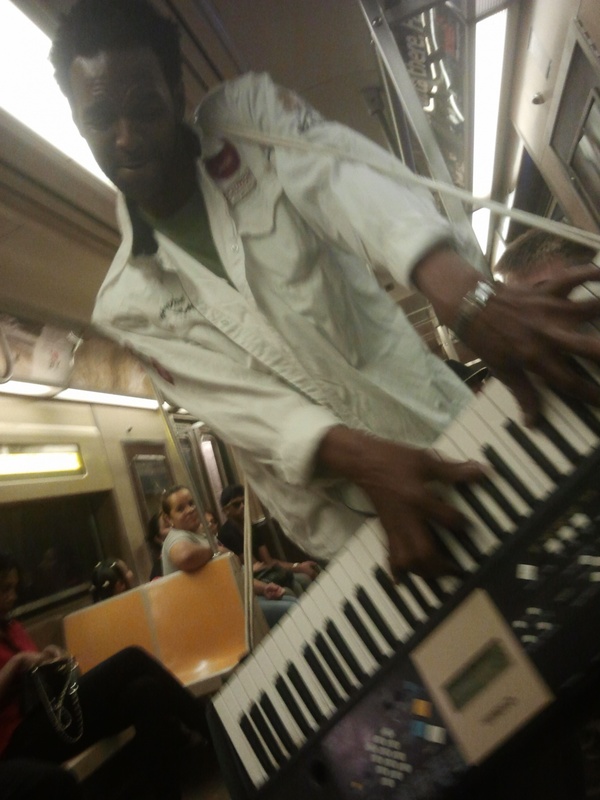 What concerns me the most is people think this is a busker, subway musician issue. But it always starts with the artists and yet ultimately continues on to everyone else. If people think this is going to stop with dancers and singers they need to think again. It’s insidious. Many people don’t care right now because it’s not affecting them or their life, but trust me, we are merely the canaries in the mine shaft. People don’t seem to get that yet. And it’s the sleepiness and denial that this has anything to do with them or their rights and freedoms that concerns me. Finally, as a singer I’d like to express something I’ve observed over the years about sound and especially young people as I’m singing underground. They seem starved for something I’m not sure they even know exists until they hear it, since so many have only heard sound via digitally manufactured MP3s. But when they hear a live human voice they change. They instinctively feel it. I’ve seen groups of teenage boys, normally too cool to show anything in front of their peers, sit up, eyes wide open, mouths agape on their chests stare at me as I’m singing. And once I’m done – I mix up a lot of styles in my music, from soul to blues and often throw in a little bit of opera at the end….there are not a lot of high notes underground – and have finished throwing in a few unexpected crazy high notes, they rub their hands up and down their arms and exclaim: ‘Man, man, woah that made my arms get all prickly…did that get your arms all prickly?’ It’s almost as if they’ve never heard a live human voice singing without being manipulated through a processor before. That to me is borderline frightening. I think there is a hunger for the unprocessed human voice and sound in general. It’s kind of akin to what we’re experiencing with our food right now. The body deteriorates when you eat only processed genetically modified food and yet within a short time after introducing real, living whole foods back into the diet, the body responds positively at lightning speed with an innate knowing of what it needs to thrive. Sound is like that to me. Real sound has so much more power than we give it credit for. That magic is not killable, but they sure are trying. This is all far deeper than the mere gentrification of a cement island in my opinion. We are going to have to fight to hang on to what makes us human here on this planet and creativity and free expression of that creativity is a big part of that. Without that, we are no better than a computer, than a machine. This is not just about buskers, this is a huge issue of who and where we see ourselves today and in the future. So many people are so completely unaware of what is going on both to them and around them and they don’t want to hear it. To watch an entire train car of men in suits, playing candy crush – grown men with no expressions on their faces, addicted to watching little colored dots move around a screen – concerns me. If that’s not the seedlings of transhumanism, it sure is inching frighteningly close to it. Still I’ll continue to do my very best to reach out through sound and music and vibration of the two, as long as I’m permitted.